While Medicare will pay for many of your healthcare costs, there are some expenses (like deductibles, coinsurance, and copays) that will be your responsibility. A Medicare supplement can help you pay for your portion of Medicare approved expenses. How do I choose a supplement that is right for me? When it comes to finding a Medicare supplement you may feel that you are wading through alphabet soup. Medicare supplements run the gamut from A to N. However, the most popular plans remain F and G. Medicare supplements are standardized, meaning a plan F will offer the same basic benefits, regardless of the company selling you the policy. Plans F and G are very similar. 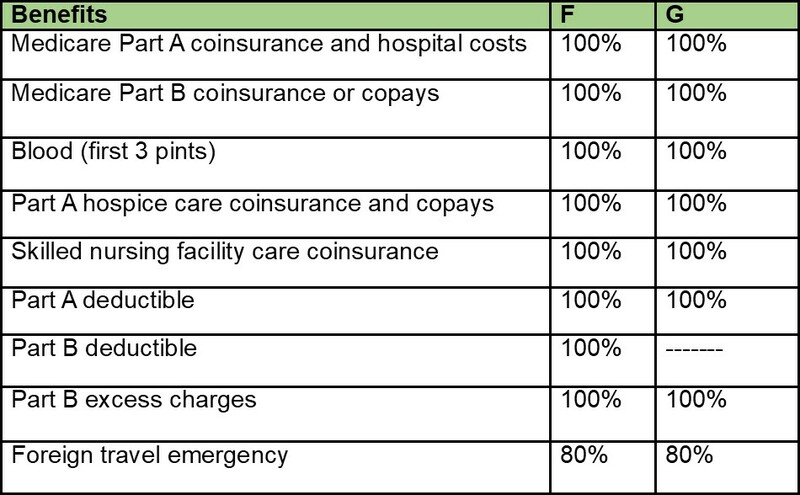 You will find that premiums for G are lower than F because G requires that you pay your Medicare Part B deductible before the supplemental insurance will begin paying your benefits. We understand there are a lot of choices out there. Remember, our agency has been selling Medicare insurance for 25 years, and we take pride in making sure you feel confident and comfortable with your choice. Regardless of whether you purchase a policy or not, we are always happy to help in any way we can. "This is a family-owned business who cares about their potential clients. I was looking for help with health insurance and even though it turns out I don't need new health insurance at this time, I feel compelled to write a review because of how thorough Brendan was. He was very knowledgeable and easy-going. He didn't seem pushy at all and listened to everything I had to say. He made sure he was getting all the information correct. I would recommend this agency for any insurance needs." - Doug C.
"I sought help from Wooten Agency; Ed, along with Nancy, took the bull by the horns and sorted things out for us very quickly. Shortly thereafter Ginny took over. She is definitely most qualified as a plan selector for Medicare plans and issues related to Medicare. My appreciation to Crystal for the gracious way she always responds to telephone calls and makes every effort to ensure one is not forgotten. And Dana....the one contact we had was enough to find out you are similarly inclined to help a client." - Frank V.
"You [Aaron] have been so helpful, and you have all taken a personal interest in my individual and specific questions in order to make the best insurance choices for my needs. Thank you all! I look forward to working together in the future months and years." - Susan H.